Click here to check out a teaser for this article. I am trying to obtain the issue to pass on some of the information provided. The first two paragraphs online are just some fluff with Judy greeting Acme customers. Not sure if Judy actually answers the question asked in the headline. Judging from past interviews, she will likely talk more about herself than the challenges that currently face Acme. 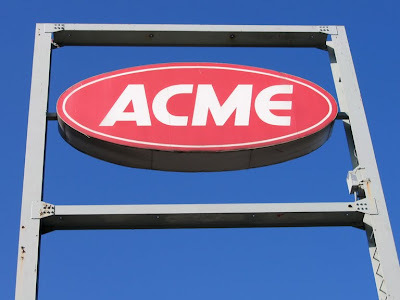 The timing of this article is a bit suspect with Acme's current situation of plummeting market share, rumors of mass store closings and SuperValu's possible desire to unload the company. UPDATE 10.31.09: Looks like this article was in the September issue which of course is long gone. Looked through the October issue and there was nothing on Judy. Anyone have the September issue? Please write in if you do and let us know if she has ANY plans for Acme's survival. 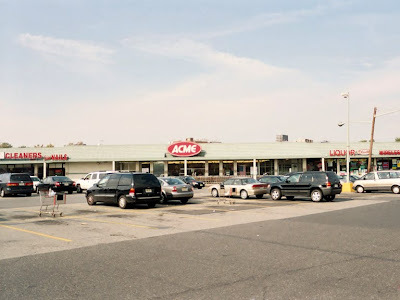 The Acme in Secauscus New Jersey closed on September 30, 2004. 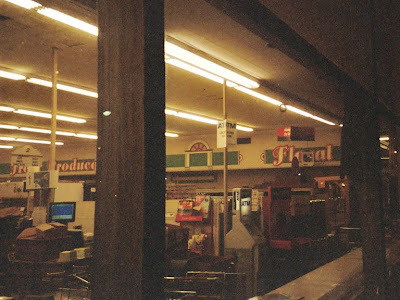 I was able to make a couple trips there while the store was in it's final days. These pictures were taken for my own collection long before this blog was ever dreamed up. The red oval logo survived til the very end. May have been replaced at some point. 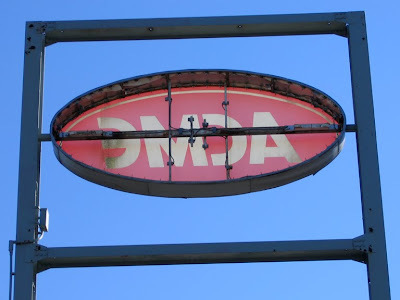 It's rare to see these signs in such good shape 15 or more years after they replaced the old fish-eye logo. "This Store Will Close Permanently on Sept. 30"... due to the landlord refusing to renew the lease. Details to come in Part 3. 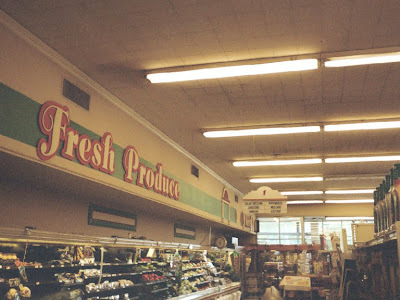 Some interior shots showing the 80's decor... a favorite here at Acme Style. Re-stocking has ceased at this point. 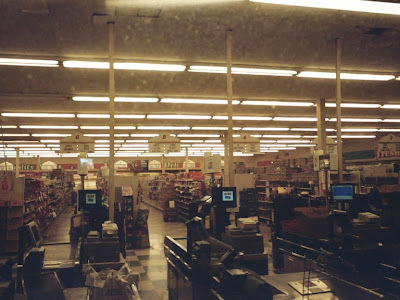 Notice the aisle signs have been replaced with the 90's styled look. 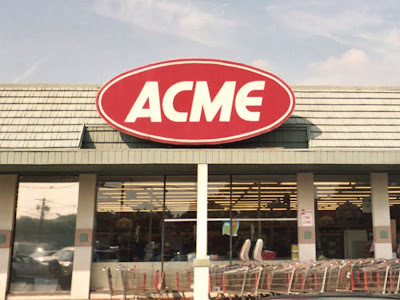 This store is the only Acme that I know of that did not receive the "Convenience Store" decor package of the 90's. 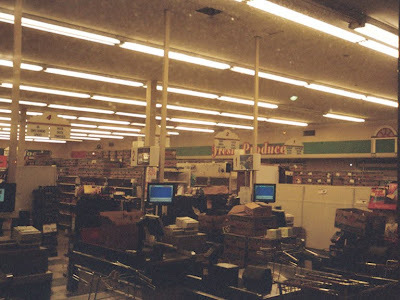 I know of no other Acme that was still sporting the 80's remodel look all the way til 2005. If you know of any others please write in! 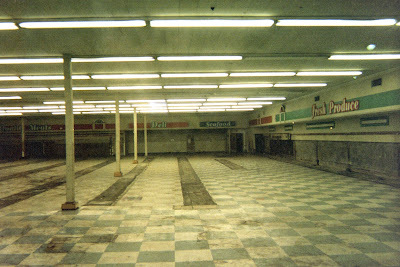 Acme had big plans for this store which may be why they skipped the minor decor changes of the 90's. 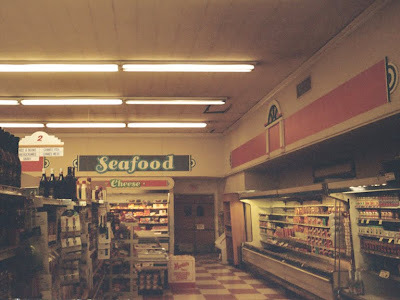 Like most 80's remodels the full service Seafood department that was added in has since been removed and replaced with a self-service frozen food case. 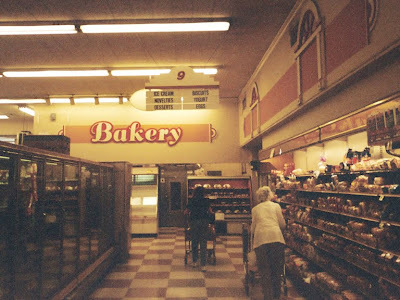 In the final years the Bakery didn't offer much in the way of "in-store" baked goods. A full look at the front of the store. The section starting with the Liquor store is set back from the front of the Acme. The parking lot was quite small. 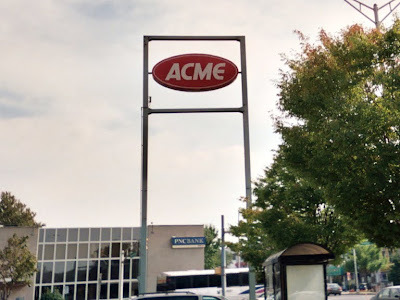 Now for the interesting twist to the story... Acme did not wish to leave this location. In fact, they were planning an expansion and massive remodel. 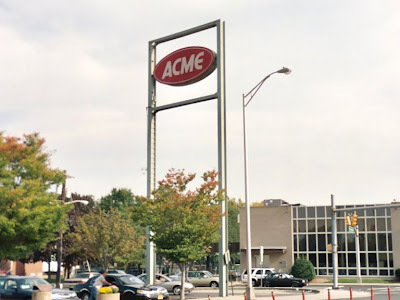 Plans for the improvements were submitted to the landlord who balked at Acme's desire to evict other tenants for their expansion. 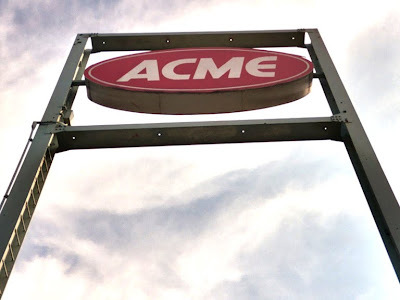 Acme revised the plans to only include renovations to the space they were already occupying. The landlord refused to even look at the plans and informed Acme that their lease would not be renewed. 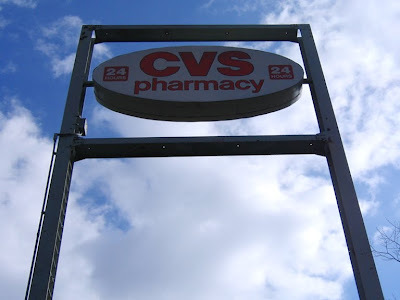 Shortly thereafter, it was announced that CVS would be moving into the space. 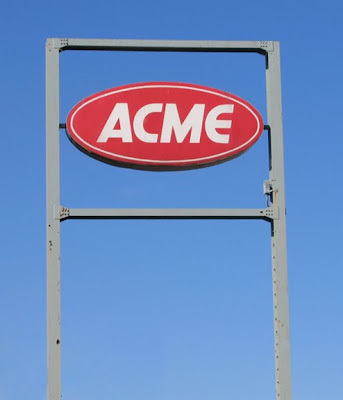 It's not clear when CVS entered the picture and if their interest influenced the landlord to kick Acme out. CVS wound up getting a whole lot more than it bargained for with this location. For starters... the building was essentially sinking as it was not constructed to withstand the swampy conditions in Secaucus. 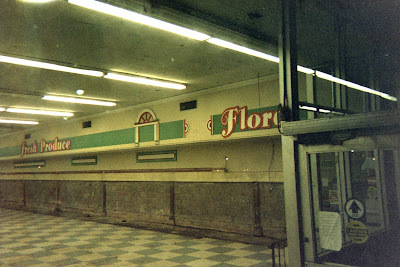 The floor of the Acme was always on the lumpy side. Your shopping cart would even roll away from you in parts of the store. 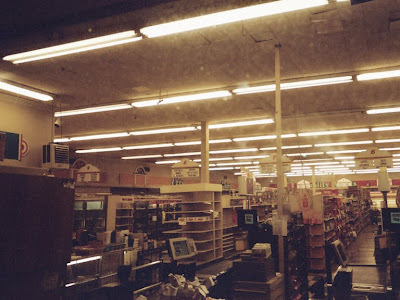 You can see, in some of the pictures above, wooden blocks underneath the support polls throughout the store which may have been used to accomodate the sinking floor. 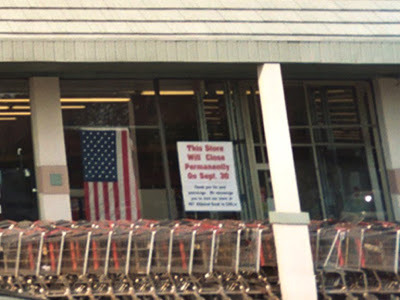 The blocks don't appear to be under the support polls to the rear of the store. 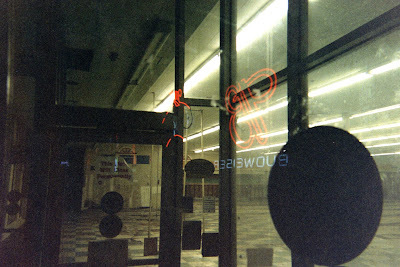 And as if a sinking store isn't enough of a problem, the building was soon found to have asbestos. It was quickly sealed with plastic and the asbestos was removed. Articles at the time implied that CVS was getting stuck with much of the costs for this unexpected work. Not sure if that's true, but if nothing else, CVS's opening was greatly delayed. 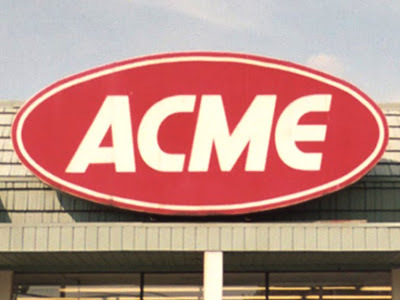 The Acme was the large section that stands further out than the rest of the stores. The backroom area extended into the section the upper left had corner of the building–the section with the lighter roof. 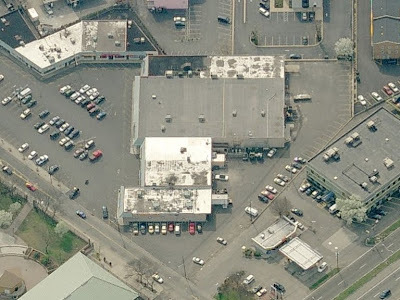 A store occupied the front half of this area–the section with the darker roof. 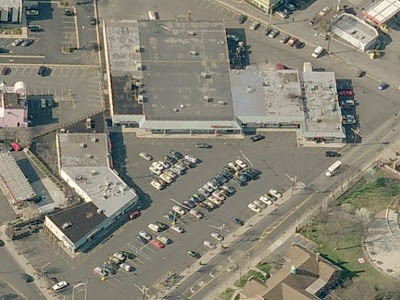 The Acme may have had an entrance and exit on both sides of the front of the store. Notice the very limited parking lot. Here you can see the lack of loading docks at the back of the store. But pretty cool artwork. 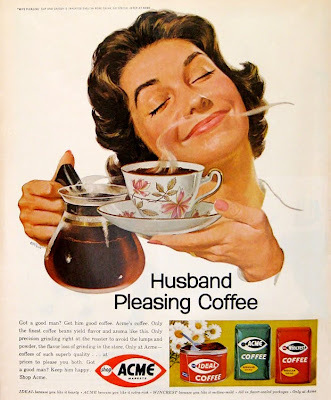 I had never heard of the Wincrest brand until I found this ad.